Google Developers Blog: The Developer Sandbox, now with Video Interviews! The Developer Sandbox, now with Video Interviews! was a new addition to this year's Google I/O. The Sandbox featured a diverse range of developers and apps, all with one thing in common -- they've all built applications based on technologies and products featured at I/O. The Sandbox was very popular with attendees and saw a lot of foot traffic throughout both days of the event. Sandbox developers welcomed the opportunity to interact with fellow developers, discuss their products and answer questions. We interviewed these developers about their apps, the challenges they faced and the problems they solved, and finally their learnings & hopes for web technologies going forward. We also asked these developers to create screencast demos of their apps, much like the demos they gave to people visiting their station during I/O. These video interviews and demos are now available in the Developer Sandbox section of the I/O website. Each developer has their own page with a brief description of their company, their app, and their interview video (if one was filmed) and screencast demo video (if available). For instance, here's a video interview with Gustav Soderstrom of Spotify, who walks us through a demo of their Android app and then talks about the platform and why Spotify chose to develop their app on Android. Are you building an app on one of Google's platforms or using Google APIs? Please send us a video about your company and your app and you could be featured on Google Code Videos. Click here for the submission form and guidelines. Each Sandbox developer page also features a Friend Connect gadget that allows anyone visiting the page to sign in with their Friend Connect id and leave comments & feedback. It's a great way to continue the conversation or to ask questions if you did not get a chance to meet them at I/O. 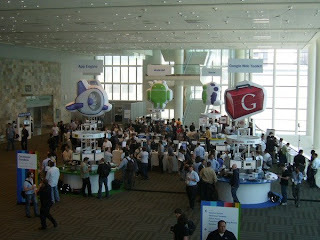 The Developer Sandbox was a new addition to this year's Google I/O. The Sandbox featured a diverse range of developers and apps, all with one thing in common -- they've all built applications based on technologies and products featured at I/O. The Sandbox was very popular with attendees and saw a lot of foot traffic throughout both days of the event. Sandbox developers welcomed the opportunity to interact with fellow developers, discuss their products and answer questions.